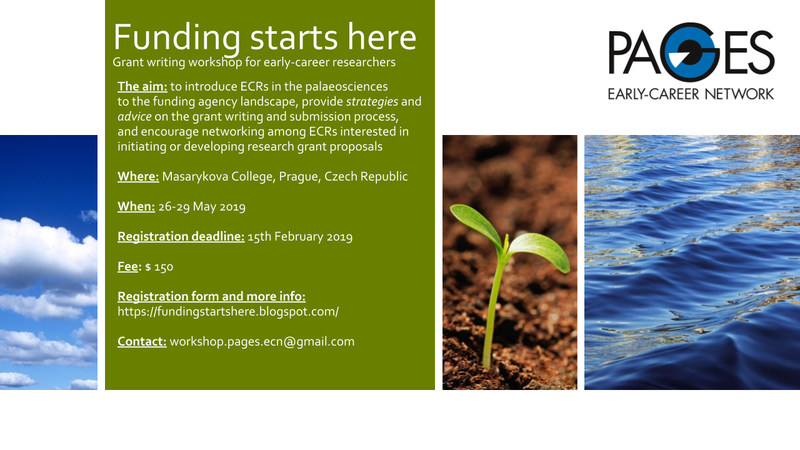 The PAGES Early-Career Network (ECN) will hold a workshop, titled "Funding starts here - Grant writing for early-career researchers" from 26-29 May 2019 in Prague, Czech Republic. Access the workshop flyer here (png). Marsarykova College, Prague, Czech Republic. This will be a grant writing workshop with the number of participants limited to 25-30. All interested scientists may apply, but priority will be given to early-career researchers (ECRs). A planned outcome of this workshop will be a guide on how to formulate a good research proposal which will be made publicly available online via the PAGES webpage. Plans are being considered to record the invited speakers' lectures for the PAGES ECN YouTube channel. The grant-writing and review process is one of many challenges for ECRs. Though it is one of the most critical responsibilities for launching, maintaining, and advancing a career involving academic research, it can seem an unfamiliar and daunting task for ECRs in an increasingly competitive funding environment. This workshop aims to introduce ECRs in the paleosciences to the funding-agency landscape, provide strategies and advice on grant writing and submission processes, and encourage networking among ECRs interested in initiating or developing research grant proposals. This three-day workshop will bring together ECRs and experienced speakers from academia and funding agencies. The general structure will consist of talks from invited speakers, as well as group work activities that will foster application of knowledge gained through the invited speakers’ presentations. These group work sessions will be assisted by the keynote speakers and include working in small groups. Participants will have the opportunity to develop grant writing skills through dedicated work sessions using either their own research ideas or provided examples for honing their writing style, structure, and review strategies. Feedback will be provided at the end of each work session where appropriate, and an overall summary and feedback round will be held at the end of the workshop. 08:30-10:00 - Talk 1 by Petr Kuneš: "Introduction to the grant proposal writing. Typical components of a proposal"
10:30-12:00 - Talk 2 by Jonas Bunikis: "Grantsmanship: Face-to-face with peer review panel. European Research Council perspective"
14:30-16:00 - Talk 3 by Marie Uhle: "The structure of NSF funding system, with the focus on grants relevant to ECRs in paleosciences"
08:30-10:00 - Talk 4 by Jana Čejkova: "Horizon 2020/MSCA programs"
14:30-16:00 - Talk 5 by Alessio Rovere: "Success story: an ERC starting-grant perspective on proposal writing and budget planning"
The registration fee is $USD150 and covers the cost of accommodation, breakfasts and lunches. Notifications will be sent to successful applicants by the beginning of March. PAGES has provided some funding for the attendance of ECRs from developing countries. See the registration form for details. This workshop is one of the deliverables that were listed in the proposal to form the PAGES ECN. One of the objectives of the PAGES ECN is to foster professional development for ECRs. The first six months of the network have been very productive, with online webinars, articles published in the Past Global Changes Magazine, blogging, splinter meetings at scientific conferences, and connections with other international ECR networks within the field of paleosciences. This will be the first workshop for ECRs organized by the ECN with the aim to provide valuable training in grant-proposal writing with keynote lectures by several esteemed professionals. In addition, this meeting provides a great opportunity to bring ECRs together to develop new research ideas and exchange perspectives.